Acclaimed Iraq war filmmaker of The Road to Fallujah and Caught in the Crossfire, now turns his lens to the frontlines of the BP Horizon disaster and chronicles the large scale cover-up of the tragic health effects following the infamous spill in 2010. There is a secret in the Gulf states. Children losing hair in large clumps, fully body rashes, severe asthma attacks and frequent seizures. Adults in respiratory distress, skin lesions that expand like a flesh-eating disease, debilitating migraines, cardiac episodes, liver failure, chemical paranoia, premature death. Sound like a horror film? It is. An Emmy and Academy Award winning team, including Mark Manning, director of The Road to Fallujah, Reuben Aaronson, producer and director of Amazon Gold and Mark Monroe, writer of The Cove and Racing Extinction, have been covering the lives of Gulf Coast residents following the 2010 BP Oil Spill and use of toxic chemical dispersants in the ‘clean-up’ operations for six years. The team is producing the documentary to be released in the fall. THE RISING may prove to be one of the most terrifying true stories of our time and its issues deserve our full attention and support. Director, Mark Manning is an industry insider. As a former oil field diver for 20 years, he knows the business well. He understands the dangers of offshore drilling and how inadequate modern spill response technology is. He has worked on well blow-outs and understands that large oil releases cannot be effectively cleaned up. 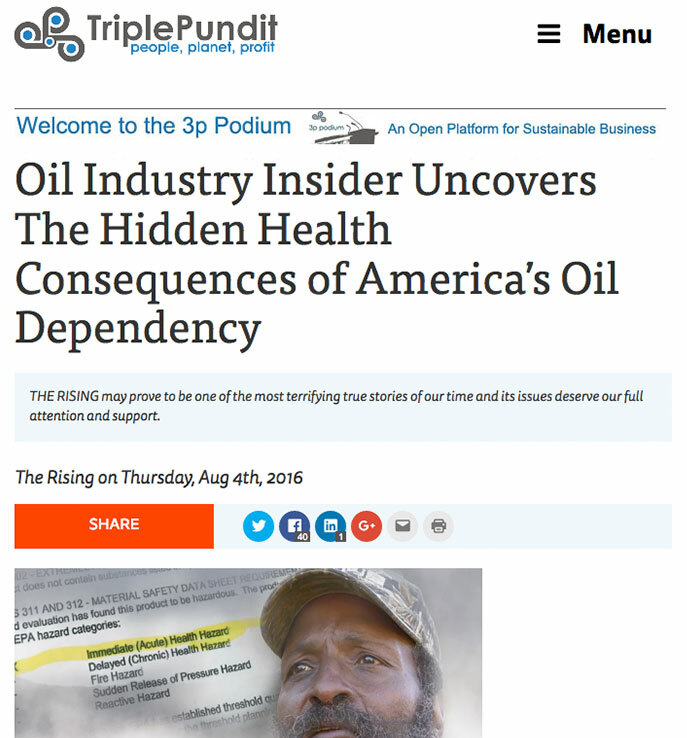 His understanding of the complexities of offshore oil gives him a unique ability to tell this story. With all his experience, he was still shocked by the large-scale chemical spill response plan, the drastic human consequence of the ‘clean-up’ operation choices, and the lack of public health oversight by U.S. government agencies. Read more on Triple pundit.